SeedRunner 3750 XL Premiers - Unverferth Mfg. The new SeedRunner 3750 XL with its X-tra Long unloading conveyor and patented self-filling design provides you with the greatest versatility and functionality yet in a seed tender. 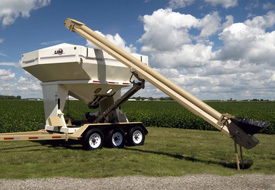 The 21' cupped and cleated conveyor raises higher making it easier to load taller items such as central fill planters. Additional features of this new model include LED lights that indicate the fill level of each compartment, adjustable spring-lift assist and pivot track with catches every 3/4" for stopping the conveyor in 10" increments. For additional details visit the Seed Runner page.